Nearly 40 years ago, Dr. Natori incidentally found that various immune proteins including antibacterial proteins are rapidly induced in the hemolymph of Sarcophaga peregrina (flesh fly) larvae when their body wall was pricked with a hypodermic needle. He successively purified these proteins and clarified their functions in insect immunity. Based on his results, insect immunity developed greatly. Therefore, he is one of the world-leading pioneers of insect immunity. 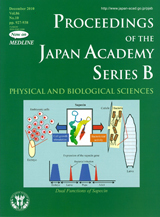 Moreover, Dr. Natori found that immune proteins also serve a role in normal development of insect. This is a completely novel aspect of insect immune proteins. As shown in the cover illustration, sapecin is an inducible bactericidal protein, but it is also a growth factor of embryonic and imaginal cells in ontogenetic development. One gene - one protein - one function is a generally accepted concept of molecular biology. Evidence of one gene - one immune protein - two independent functions obtained in Dr. Natori’s studies will extend a new paradigm in insect biology.